We have always prided ourselves on keeping the most extensive selection of UK coins in the world, bar none. Its been our modus operandi since we began in 1997. 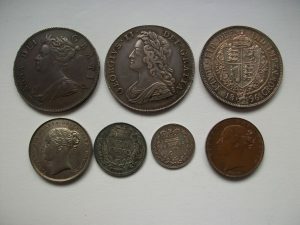 If you want a cheap clear date 1905 Half Crown or a lower grade 1863 Sixpence, no problem, these are our stock in trade. If you want that key date, we are the people to contact. However recent times have seen us expand somewhat, and we have moved into dealing in some very choice and high value items. Our new Winter 2016 catalogue, which we have just uploaded has some cracking material. We have a couple of 5 Guineas, always very desirable, a couple of superb 2 Guineas, one of the finest known 1664 Guineas, stacks and stacks of other gold coins, and with Gold going up and up in the wake of the Brexit vote, many of you have turned here for an investment. Its not just gold, we have some wonderful Crowns from 1662, 1679, 1687, 1692, 1700 and the list really does go on and on. We hope you enjoy looking through our list, in the unlikely event that you find nothing of interest (you must try a little harder! ), do still contact us, as we have thousands of coins which are not listed, many will never be listed, and we may well be able super selection of rare and choice coins. Don't miss out have a thorough look today. We have completely revised our Banknotes section and added hundreds of new items! We now have a massive range of Scottish notes and English notes. We also have a fantastic range of modern Silver proofs from around the world including Canadian, US and much more. We have also purchased a group of Australian mint sets which are surprisingly scarce.